The statistic depicts the income (salaries & endorsements) of the highest-paid soccer players in the world in 2017. 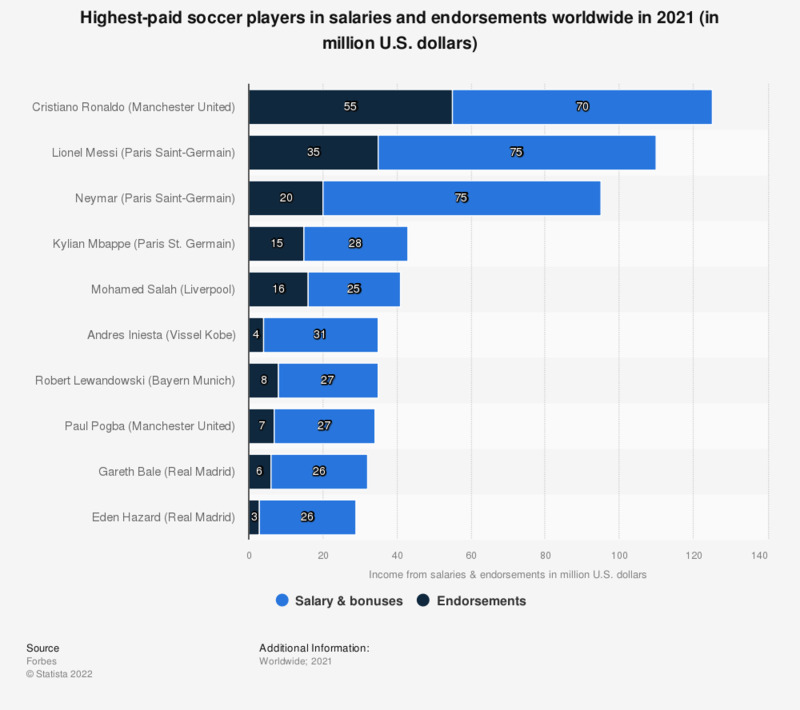 Lionel Messi was the highest-paid player in 2017, earning 84 million U.S. dollars in salaries and bonuses and 27 million U.S. dollars from endorsement deals. Real Madrid is the most valuable European soccer team, and one of the most valuable sports team brands in the world. The Madrid-based team also has the most titles in the UEFA Champions League – 11 titles as of 2016. For these reasons, it is no surprise that two of the top 5 highest-paid soccer players in the world play for Real Madrid. The Portuguese star Cristiano Ronaldo leads the ranking with 53 million U.S. dollars in salary and bonuses, and 29 million U.S. dollars in endorsements in 2015. With 89 goals as of 2015, the Real Madrid forward is the all-time top scorer in the UEFA Champions League since 1955. Ronaldo’s teammate Gareth Bale is the fifth highest-paid soccer player in the world, earning a salary of 24 million U.S. dollars in 2015 and also generating 10 million U.S. dollars in endorsement income. FC Barcelona’s Lionel Messi is the second highest paid soccer player in the world. In 2015, the Argentinean forward earned 51 million U.S. dollars in salary and bonuses, and 26 million U.S. dollars in endorsements. Messi has scored a total of 80 goals in his career in the UEFA Champions League, second highest figure in the league. He also has won the Ballon d’Or/FIFA Ballon d'Or award – the most prestigious award in soccer – a total of five times. Since the beginning of his professional career in 2004, Messi led FC Barcelona to four UEFA Champions League titles, and to a series of other successful results. As of 2015, FC Barcelona is one of the most valuable sports team brands in the world, valued at 437 million U.S. dollars. Along with Messi, forward Neymar is one of the current stars in the FC Barcelona roster. The Brazilian soccer player is the fourth best paid soccer player in the world, with a total of 36 million U.S. dollars in income, just behind Paris St. Germain’s Zlatan Ibrahimovic, with a 37 million U.S. dollars income. * Figures include soccer salaries, bonuses, and endorsements earned in 2017.